Orac Decor is the leading European manufacturer of innovative decorative synthetic mouldings and ornaments. Their extensive and complete collections range from stylish baseboards, wainscoting, panel and cornice mouldings to innovative cove lighting and distinctive architraves, pilasters and a wide range of ceiling medallions, along with rosettes and domes. Their products are not just durable and light, they are also easy to install too. Orac Decor offers contemporary quality solutions that are both functional and decorative to suit every project. Orac Decor Ceiling Medallions: Easy to install decorative ceiling accents and ceiling medallions. These ceiling medallions are offered in almost every size to meet your architectural and home design needs. Orac Decor Extra Small Ceiling Medallions (Under 10 in. ): Extra small ceiling medallions under 10 inches in diameter. Orac Decor Small Ceiling Medallions (10 in. - 20 in. ): Small ceiling medallions between 10 and 20 inches in diameter. Orac Decor Medium Ceiling Medallions (20 in. - 30 in. ): Medium ceiling medallions between 20 and 30 inches in diameter. Orac Decor Large Ceiling Medallions (30 in. - 40 in. ): Large ceiling medallions between 30 and 40 inches in diameter. Orac Decor Non-Elliptical Medallions: Ceiling accents & ceiling medallions with a non-elliptical design (squares, diamonds, rectangles, etc.). 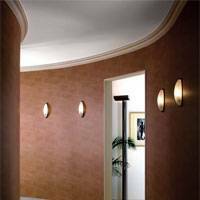 Orac Decor Domes: Dramatically enhance an entry way or room and increase the ceiling height with a decorative architectural ceiling dome. 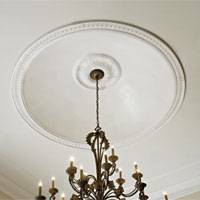 Orac Decor Rims: Highlight your lighting fixtures and ceiling with an architectural ornamental rim. Orac Decor Rosettes: Rosettes offer as easy to install and simple quick decorative solution for any architectural project. Orac Decor Crown Moldings: Intricate crown moldings with precision detail to add an elegant decorative architectural touch to any room or outside of a building. Orac Decor Extra Small Crown Mouldings (Under 2 in. ): Extra small crown mouldings under 2 inches in height. Orac Decor Small Crown Mouldings (2 in. - 4 in. ): Small crown mouldings between 2 and 4 inches in height. Orac Decor Medium Crown Mouldings (4 in. - 6 in. ): Medium crown mouldings between 4 and 6 inches in height. Orac Decor Large Crown Mouldings (6 in. - 8 in. ): Large crown mouldings between 6 and 8 inches in height. Orac Decor Extra Large Crown Mouldings (Over 8 in. ): Extra large crown mouldings between over 8 inches in height. Orac Decor Chair Rails: Decorative chair rails to add a touch of architectural detail and enhance the wall decor. 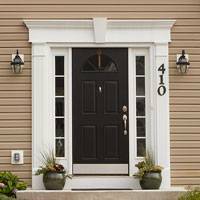 Orac Decor Casings: Decorative trim moldings and casings to enhance the framing around doors and windows. Orac Decor Friezes: Decorative friezes to add a touch of architectural detail and enhance the wall decor. Orac Decor Multifunctional Trims: Simple multifunctional trims available in many sizes for any variety of projects imaginable. Orac Decor Panel Molding: Use panel moldings to instantly and easily create frames on walls and ceilings. 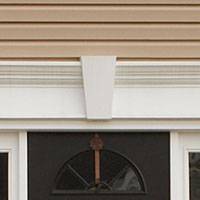 Orac Decor Panel Molding Corners: Use panel molding corners to add an elegant curved corner to panel moldings. Panel molding corners eliminate the need to miter corners and offer a simple and unique solution for creating frames on walls and ceilings. Orac Decor Baseboards: Simple and ornate decorative baseboards to match crown moldings and chair rails and enhance the entire room. Orac Decor Flexible Molding: Flexible moldings offer an excellent architectural design solution for walls with a concave or convex curvature. Category consists of pre-formed rigid flex moldings. Other profiles may be custom made in flex depending on project's specific requirements. Orac Decor Flexible Baseboards: Simple and ornate decorative flexible baseboards to match flexible crown moldings and chair rails and enhance the entire room. Orac Decor Flexible Crown Moldings: Intricate flexible crown moldings with precision detail to add an elegant decorative architectural touch to any room or outside of a building. Orac Decor Flexible Chair Rails & Panel Moldings: Use flexible panel moldings & chair rails to instantly and easily create frames on walls and ceilings with a curvature. Orac Decor Moulding Accessories: Molding accessories to complement moldings, such as molding blocks, pre-mitered inside corners and pre-mitered outside corners, or Focal Point's Quick Clips molding installation system and Focal Point's Moulding Mates. Orac Decor Entry Systems: Creatively mix-and-match keystones, pilasters, capitals, plinths, transoms, crossheads and pediments to create an elegant entry way. Orac Decor Capitals: Entry system capitals to complement an elegant architectural entry way. Orac Decor Crossheads: Individual crossheads to add architectural detail to an entry way. Select crossheads can be used with keystones while others can be customized with keystones. Orac Decor Pilasters: Entry system pilasters to complement an elegant architectural entry way. Orac Decor Plinths: Entry system plinths to complement an elegant architectural entry way. Orac Decor Keystones: Collection of keystones to be coordinated with window headers, entry system crossheads and door headers. Orac Decor Round Full Columns: Decorate plain round and fluted round full columns. Collection includes tapered round and non-tapered round full columns. Orac Decor Round Plain Full Columns: Decorate plain tapered and non-tapered round full columns of various sizes. Orac Decor Round Fluted Full Columns: Decorate fluted tapered and non-tapered round full columns of various sizes. Orac Decor Round Full Column Caps and Bases: Decorative caps and bases for round full columns. Orac Decor Round Half Columns: Decorate plain round and fluted round half columns. Collection includes tapered round and non-tapered round half columns. Orac Decor Round Plain Half Columns: Decorate plain tapered and non-tapered round half columns of various sizes. Orac Decor Round Fluted Half Columns: Decorate fluted tapered and non-tapered round half columns of various sizes. Orac Decor Round Half Column Caps and Bases: Decorative caps and bases for round half columns. Orac Decor Accents: Enhance any interior or exterior space with a simple and easy to install wall accent or applique. Orac Decor Corbels: Use corbels in any exterior or interior decor design to transform shelves, cabinetry, entry ways, frames or even mix them with mouldings. Orac Decor Niches: Transform any wall dramatically with a niche or use a niche kit to add an elegant bookcase to a wall. Orac Decor Raised Paneling: Give ordinary doors and walls a classic and elegant look with raised panels. Panels can be used as door panels in a variety of configurations or on walls as wainscot paneling. Orac Decor Shelves & Mantels: Use a shelf and mantel to quickly and easily display picture frames or collectibles. These shelves are full of decorative architectural detail and are easy to install. They can be combine with a set of corbels for a unique look. Orac Decor Adhesives & Tools: Adhesives and tools to easily and quickly install all polyurethane products offered. Axxent, a collection by Orac Decor, is a high-quality, solution-oriented range of mouldings. 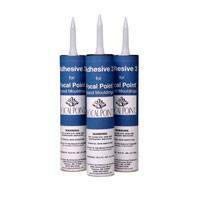 This complete range helps skilled decorators to deliver first-rate work at an affordable price. It includes cornice and panel mouldings, door frames and multifunctional profiles. Discover a world of possibilities and solutions with Axxent. Basixx, a collection by Orac Decor, is an inventive, original and budget-friendly collection that completes each interior in a timeless way. These ornamental frames connect wall and ceiling elegantly so the play of light and shadow can burst out. Luxxus occupies an exclusive position within the overall Orac Decor brand, as it contains a unique selection of luxury creative profiles and decorative accessories. A complete range to provide a total concept with real style - from cornices and panel mouldings, ceiling medallions, baseboards and wainscoting to lighting systems and door furniture, all with that little extra something. The different mouldings are united in their strong visual impact, which means they help set the tone of an interior with their striking looks and contours or their conspicuous dimensions.